Seiko Melody in Motion Musical Wall Clocks are a fun and attractive addition to home decor. This Seiko Melody in Motion Musical Wall Clock is hanging on my living room wall. We have moved it from Arkansas to Texas, back to Arkansas, to Missouri, and then to Oklahoma in the past 10 years. It has fallen off the wall twice (we finally moved it to another wall away from the door kids keep slamming), and even with all the moving and the falls, it still works great (as long as we replace the batteries every year or so!). 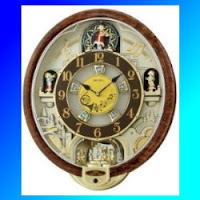 When the clock strikes the hour, the musician on top sways back and forth, and the crystals just inside the numbers on the clock face turn in a circle around the face. The rotating pendulum at the bottom is always turning, the crystals catching the light and reflecting it back into the room. We bought this clock for Christmas 2006. Our youngest grandson was about 18 months old, just walking good, but still not talking much when we bought it. He absolutely loved it. On the hour, it plays one of six songs. Where ever he was in the house, he would run to the living room and point at the clock until it quit playing. He enjoyed it so much, my husband told him that someday, after grampa died, the clock would be his. For the next two hours, he cried and screamed. We never did figure out if it was because he had to wait to get the clock, or if it was because grampa had to die first. Today, he still loves the clock. One of his favorite activities is to push the button so that he can hear the music. He proudly tells his siblings and cousins not to touch the clock, because someday it will be his and he doesn't want it broken. Grampa and I don't intend for him to have the clock anytime soon, but we still plan for the clock to be his someday. There are a large number of different clocks that play melodies on the hour. My Aunt's Greatgrandchildren Love Her Seiko Melody in Motion Clock! A while back, I was visiting an aunt I don't get to see very often, when I noticed she had a Seiko Melody in Motion Musical Wall Clock, too. She told me her greatgrandchildren love it as much as my grandson loves ours. Another aunt had seen hers and bought one, too. They have never been in my home, since I live so far away, so they didn't know I had one, too. Their clocks are similar, but subtly different from mine. There are several styles. Some play six songs, some play eight, some twelve. All of the Melody in Motion clocks have some kind of motion in them during the song playing on the hour. Some even have a clock face that opens up into two or more pieces to show moving clockworks beneath the clock face while the music plays. Most of them have an electronic eye that prevents the music from playing in a darkened home. These clocks are fun, beautiful, and durable. They would make excellent graduation, wedding, birthday, or Christmas gifts for almost anyone on your list. And the Swarovski elements really make these clocks sparkle! Watch the video below to see how this clock works. Do you have a Seiko Melody in Motion Musical Wall Clock? What is your favorite type of wall clock?